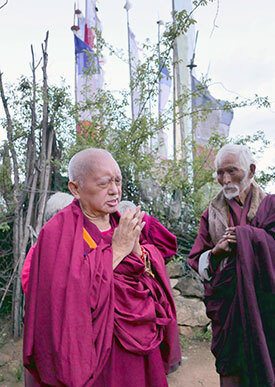 Lama Zopa Rinpoche, Paro, Bhutan, May 2016. Photo by Ven. Roger Kunsang. Get Ready for the New Issue of Mandala! Lama Zopa Rinpoche visiting Thaksang Monastery, Bhutan, June 2016. Photo by Ven. Lobsang Sherab. 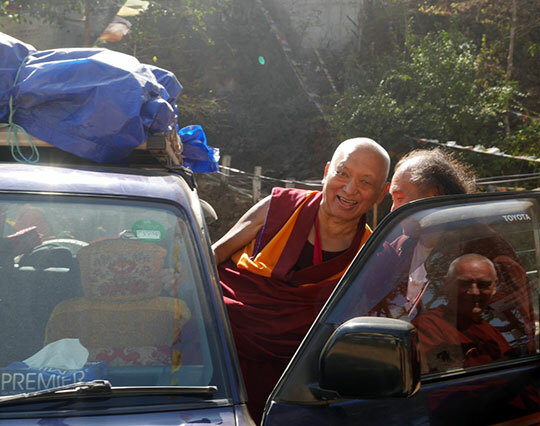 Lama Zopa Rinpoche departing from Maratika Caves, Nepal, February 2016. Photo by Ven. Lobsang Sherab. Shared by Ven. Roger Kunsang on his Twitter page. Lama Zopa Rinpoche with attendant Ven. Sangpo Sherpa at Maitreya Instituut Loenen, July 2015. Photo by Ven. Thubten Kunsang. While Lama Zopa Rinpoche was at Maitreya Instituut Loenen in July 2015, Rinpoche gave a short impromptu talk on offerings. Rinpoche talked about the incredible merit that one can collect making offerings to different beings from parents up to numberless buddhas and gurus. 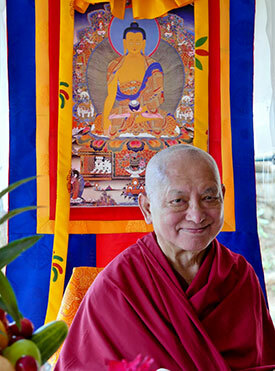 Watch the video of Lama Zopa Rinpoche talking about making offerings on YouTube. Lama Zopa Rinpoche offering tsog with Khadro-la (Rangjung Neljorma Khandro Namsel Drönme) at Kyichu Lhakhang, one of the holiest temples in Bhutan, May 2016. Photo by Ven. Roger Kunsang. Through the generosity of International Merit Box practitioners and communities worldwide, 21 new grants have been given in 2016 to help a wide range of Dharma activity – the publishing of new books in two languages, the construction of five new holy objects, service projects for care providers, and more. See the full list here! A Tibetan resident at one of the homes in India supported by FPMT Charitable Projects, South India, December 2015. Photo by Ven. Roger Kunsang. 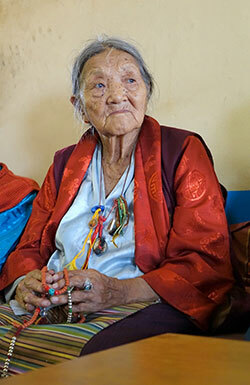 Due to the kindness of a generous benefactor, FPMT has been able to invest more resources into taking care of the elderly Tibetans living in India, many of whom fled Tibet starting in 1959. Many elderly first-wave Tibetan refugees have very little prospect of accommodation or support as many are without families of their own. Offering support is one way that FPMT can help repay the kindness and bravery of the Tibetan people. 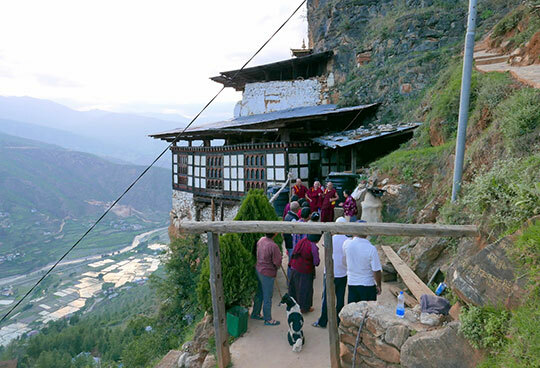 Over the last six months FPMT Charitable Projects has assessed the needs of older Tibetan refugees and found four residential facilities in need of assistance. To date, a total of US$135,996 has been offered in grants to help these homes carry out their work. Please read more about these grants and the homes supported. Ven. Tenzin Tsomo has joined International Office as the Assistant Content editor for Education Services. Venerable Tsomo is working part time in this role while also continuing to serve as the Spiritual Program Coordinator at Land of Medicine Buddha. 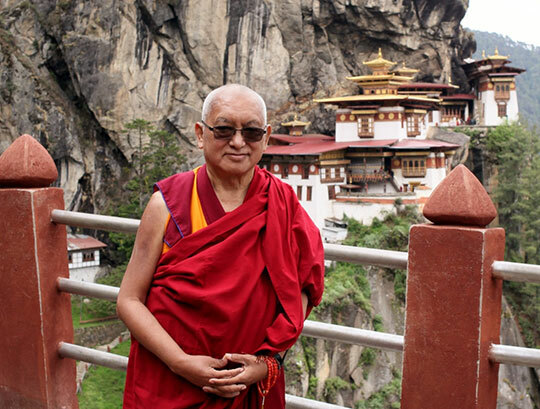 Lama Zopa Rinpoche in Bhutan, June 2016. Photo by Ven. Roger Kunsang. Many, many thanks to all supporters of the Work a Day for Rinpoche campaign – all the donors, Golden Light Sutra reciters, and others! Over 580 students from 53 different countries donated to the campaign this year during the month of Saka Dawa in order to help us take more steps toward actualizing Lama Zopa Rinpoche’s compassionate vision for the world and FPMT. We rejoice! On July 6, the newest print issue of Mandala begins making its way around the world. In this issue, we explore secular, Buddhist-inspired education (what Lama Yeshe called “Universal Education”) with teachings from His Holiness the Dalai Lama, Lama Yeshe and Lama Zopa Rinpoche. Plus, we talk with Foundation for Developing Compassion and Wisdom (FDCW) about the popular 16 Guidelines for a Happy Life program and their new program the Art of Fulfillment, and we hear from Maitripa College about its new Mindfulness and Compassion Initiative and from Istituto Lama Tzong Khapa about its plans for an Academy of Mind Science and Valid Cognition – all examples of the principles of Universal Education in action. Also, enjoy a passionate interview with Prof. Robert Thurman about the importance of His Holiness the Dalai Lama to the scientific world and the relevance of Buddhist science; and reminisce with long-time student Jon Landaw about Lama Yeshe’s extraordinary ability to communicate. To help support your practice, our listing of retreats is available online and is regularly updated! This newly designed weekend seminar for existing and potential FPMT registered teachers, course facilitators and meditation leaders is being piloted in four FPMT centers this year (note, Mahamudra Centre has changed its date). The seminar will introduce principles of contemporary Dharma pedagogy (method and practice of teaching). The workshop is experiential and participatory, and is suitable for experienced Dharma teachers and complete beginners alike, as it stimulates reflective practice and a sense of professional development, which are essential processes for everyone helping others learn Dharma in FPMT education programs. Lama Zopa Rinpoche outside the tiny gompa housing the holy site of Guru Rinpoche’s body, Drakarpo, Paro, Bhutan, June 2016. Photo by Ven. Roger Kunsang. Lama Zopa Rinpoche recommended this Guru Rinpoche incense recipe and Khachoe Ghakyil Ling, the FPMT nunnery near Kopan Monastery, is making it available to students everywhere. All FPMT centers, projects and services get a special discount. Find more information and ways to order. We welcome Gonpo Ludup Study Group (probationary center) in California, USA! Offered by the Lotsawa Rinchen Zangpo Translator Program, this six-week course of intensive study in McLeod Ganj, India, starts September 5. In this course you will learn how to read Tibetan, speak basic conversational Tibetan, understand basic literary grammar and learn common Dharma terms that are in used in texts and teachings. If are you looking for systematic and graduated explanations on Tibetan grammar and Dharma words, this is the place for you! FPMT International Office, USA needs French and Spanish translators; Tara Redwood School, USA is looking for elementary and assistant teachers.